7 Kids and Us: Visit Ripley's Believe it or Not Orlando Florida for $5! Visit Ripley's Believe it or Not Orlando Florida for $5! Orlando, Fla. (Oct. 15, 2012) - Ripley's Believe It or Not! is bringing back its Gimme Five Food Drive campaign to combat hunger in all the cities where it has Believe It or Not! Odditoriums. This year's event will take place from Sunday, November 4 through Thursday, November 8. 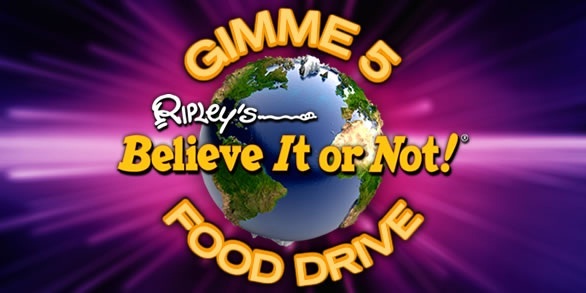 Here's how it works: guests who bring a donation of five non-perishable food items can get a ticket to Ripley's Believe It or Not! Orlando Odditorium for just $5 (regular adult ticket price is $19.99). All the food collected will go to the Second Harvest Food Bank of Central Florida. "This is a win-win situation," said Jim Pattison Jr., President of Ripley Entertainment Inc. "We're able to help needy families put food on the table and also offer a great discount when families visit our Odditoriums." Last year's Gimme Five Food Drive netted more than 15,000 donations and helped feed tens of thousands of people across the country. Second Harvest Food Bank of Central Florida has provided more than 33 million pounds of groceries over the past 12 months. Second Harvest provides more than 500 nonprofit agencies in Central Florida with food to give to their clients. Many food bank clients say their children have to skip meals because there is not enough money for food. Suggested donations include juice, soup, beans, tuna, cereal, canned fruits and vegetables, peanut butter, pasta, tomato sauce and baby food. Ripley's Orlando Odditorium is located at 8201 International Drive. Hours are from 9:00 am to midnight daily (last entry is at 11:00 pm). Ripley's "Gimme Five" promotion may not be combined with any other offers. One discount ticket available for every 5 non-perishable food items donated. Ripley Entertainment Inc. (www.ripleys.com), keepers of the venerable Ripley's Believe It or Not! brand, is a global leader in location-based entertainment, entertaining more than 12 million annually at its 80-plus attractions in 10 countries. In addition to its 32 Believe It or Not!Odditoriums, the Orlando, Florida-based company has publishing, licensing and broadcast divisions, best-selling books and the popular syndicated cartoon strip, Ripley's Believe It or Not!, that still runs daily in 42 countries. Ripley Entertainment is a Jim Pattison Company, the third-largest privately held company in Canada.